Dood! 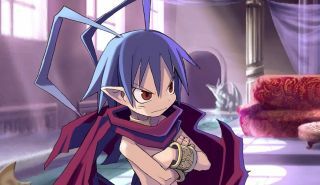 Disgaea PC now available on Steam. It features all the goodness of the famed strategy-RPG series that debuted all the way back in 2003, enhanced with PC-specific upgrades like an improved UI and textures, support for keyboard and mouse, Steam achievements, cloud saves, badges, and trading cards, and all the content from the PSP game Disgaea: Afternoon of Darkness. That's the good news. The bad news is that it's not be the most elegant PC port ever. We took it for a quick spin, and it doesn't look great. Resolution can't be adjusted beyond selecting full-screen or windowed mode, and enabling v-sync locks the game at 30 FPS. Given that the movement speed of your character is dependent upon the framerate, that's potentially problematic. The screen below, which we captured in our gameplay session, isn't going to win any prizes either, but it is after all a port of a port of a PS2 game from 2003. The Steam forums seem divided on the issue, with some users reporting significant problems and others saying it runs flawlessly. Playing the game on an AMD-based PC may be a factor, and disabling SSAO may improve things somewhat as well. The bright spot in all of this is the Steam refund policy, which means you can grab Disgaea, take it for a spin, and get your money back if it is in fact a train wreck. Have you tried it? Let us know how it goes in the comments.